Activist and engineer Ziad Abs was among the first to post calls to donate. His LOGOS, a non-profit organization in the Achrafieh neighborhood of Beirut, is gathering donations. Those who are interested in donating can call the number posted on Facebook or Twitter. Abs added that the section of the bookstore that was destroyed housed literature, law, and old religious books. Logos is accepting any sort of book, but only books, not financial donations. In response to a tweet about how not all financial donations always go to the right place, Abs said that they were only accepting donations of books, and that cash should be coordinated with Father Ibrahim Srouj. 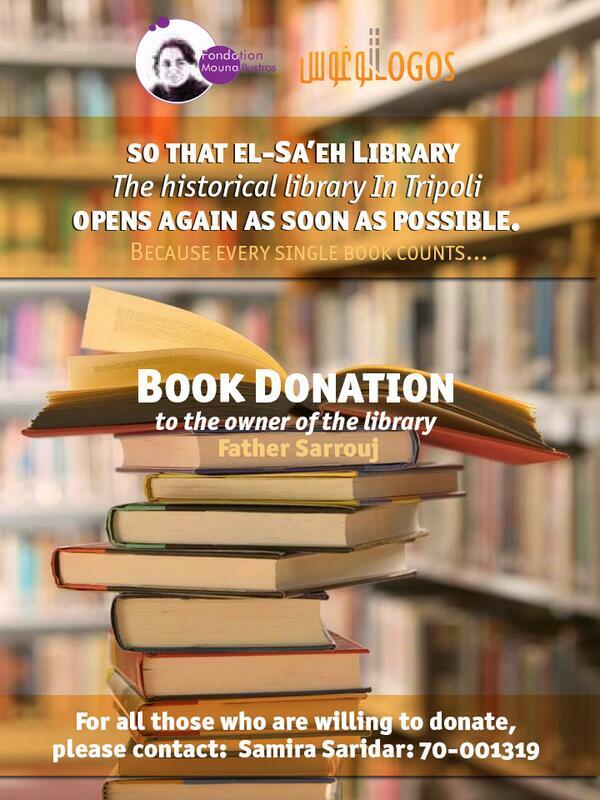 I was a regular customer at Father Ibrahim Sarrouj’s bookshop in Tripoli. As an avid young reader of modest means, I was familiar with almost every permanent and itinerant seller of used books in Tripoli and Beirut. Not only were their books cheaper than new books, they were also much more interesting, titles that the regular shops didn’t have. Every book was a find, and I could remember where and from whom I bought each book. So while you might be able to get C.S. Lewis’s Chronicles of Narniaat Jarrous’s bookshop in the prosperous part of town, at Father Sarrouj’s shop, in a small alley near the Mansouri Mosque, I found and later read at one sitting Lewis’sScrewtape Letters. On that day, seeing my interest in Lewis, Father Sarrouj also recommended Lewis’s Mere Christianity. This was twenty years ago. I haven’t seen either of these books anywhere else in Lebanon since. Father Sarrouj would say that “he knew what he had,” and he drove a hard bargain. His shop is where I broke my bargaining teeth. Coming to the front to pay, I would rehearse in my head what I thought each book was worth, and which books I would let go of if the price was too high. Sometimes, the bargaining would be delayed and made more tense when it was Father Sarrouj senior at the front (both of them were Orthodox priests), and I had to wait for the son to return, sometimes on another day, because “only he knew the prices.” Keep reading. Reblogged this on Fragments of Insanity meant to Guide the Sane.